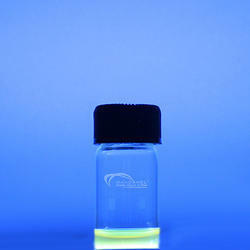 We have emerged as the foremost manufacturer and supplier of Quantum Dot. This product is formulated using quality tested chemical composition and other related ingredient. The offered product is available in various technical specifications and can be availed in different packing quantity within promised time frame. Our product is extremely admired for its purity, skin friendliness, precise pH value, accurate composition and longer shelf life. PbS LED QDs are extremely small semiconductor structures, usually ranging from 2- 10 nanometers (10-50 atoms) in diameter. At these small sizes materials behave differently, giving quantum dots unprecedented tunability and enabling never before seen applications to science and technology. 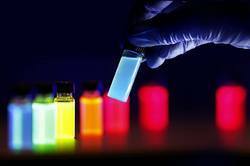 Upconverting Quantum Dots is a new type of environmentally friendly “green” semiconductor nanomaterials; as broadband gap semiconductor material, ZnSe is an important material to make blue green band semiconductor light-emitting devices. 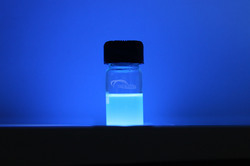 Synthesized using our proprietary technology, our Upconverting Quantum Dots have uniform size distribution, high quantum yield, and high stability, can be used in optoelectronic devices, solar cells, biomarkers, and other fields. ZnSe/ZnS Quantum Dot optical absorption in various nano-crystals, found to be several orders of magnitude greateras compared to those in bulk materials. Earlier study of ZnSe QDs embedded in the glass indicates the absence ofnonlinear absorption. The third order nonlinear optical prop-erties of colloidal CdSe and CdSe/ZnS core/shell QDs. Pbs Quantum Dots Solar Cells are extremely small semiconductor structures, usually ranging from 2- 10 nanometers (10-50 atoms) in diameter. At these small sizes materials behave differently, giving quantum dots unprecedented tunability and enabling never before seen applications to science and technology. PbS QDs are extremely small semiconductor structures, usually ranging from 2- 10 nanometers (10-50 atoms) in diameter. At these small sizes materials behave differently, giving quantum dots unprecedented tunability and enabling never before seen applications to science and technology. 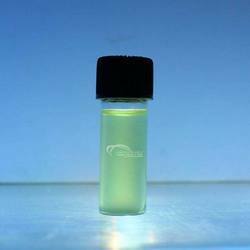 We are remarkable entity, engaged in providing superior assortment of Cadmium Sulfide Nanopowder. The offered product is processed using high grade basic ingredient in compliance with international quality standards. This product is widely used in various industries. To ensure excellent quality, this product is quality tested on well defined parameters by our team of quality analysts. InP/ZnS QDs is a new type of environmentally friendly “green” semiconductor nanomaterials; as broadband gap semiconductor material, ZnSe is an important material to make blue green band semiconductor light-emitting devices. Synthesized using our proprietary technology, our ZnSe/ZnS QDs have uniform size distribution, high quantum yield, and high stability, can be used in optoelectronic devices, solar cells, biomarkers, and other fields. Pbs Quantum Dots are extremely small semiconductor structures, usually ranging from 2- 10 nanometers (10-50 atoms) in diameter. At these small sizes materials behave differently, giving quantum dots unprecedented tunability and enabling never before seen applications to science and technology. 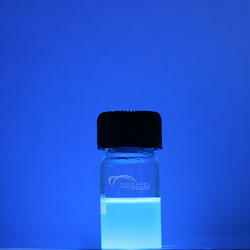 Lead Sulfide Quantum Dots are extremely small semiconductor structures, usually ranging from 2- 10 nanometers (10-50 atoms) in diameter. At these small sizes materials behave differently, giving quantum dots unprecedented tunability and enabling never before seen applications to science and technology. PbS imaging QDs is a new type of environmentally friendly “green” semiconductor nanomaterials; as broadband gap semiconductor material, ZnSe is an important material to make blue green band semiconductor light-emitting devices. Synthesized using our proprietary technology, our PbS imaging QDs have uniform size distribution, high quantum yield, and high stability, can be used in optoelectronic devices, solar cells, biomarkers, and other fields. 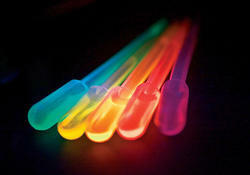 Clients can avail the offered range of Quantum Dots from us. This product is formulated with the help of premium quality chemical compound and sophisticated technology in compliance to set company norms. The offered product is sternly monitored on various parameters to ensure its quality. Clients can avail this cleaner from us in various packaging options as per their requirements. 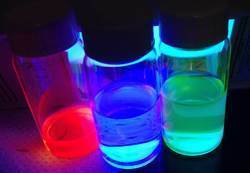 Quantum dots are extremely small semiconductor structures, usually ranging from 2- 10 nanometers (10-50 atoms) in diameter. At these small sizes materials behave differently, giving quantum dots unprecedented tunability and enabling never before seen applications to science and technology. 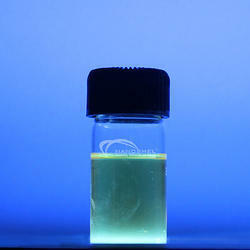 Looking for Quantum Dot ?